The Bureau of Labor Statistics released projections of employment from 2012-22. Employment rose only from 142 million to 145 million between 2002 and 2012, reflecting the 2008-09 recession, and is expected to climb to 161 million by 2022. 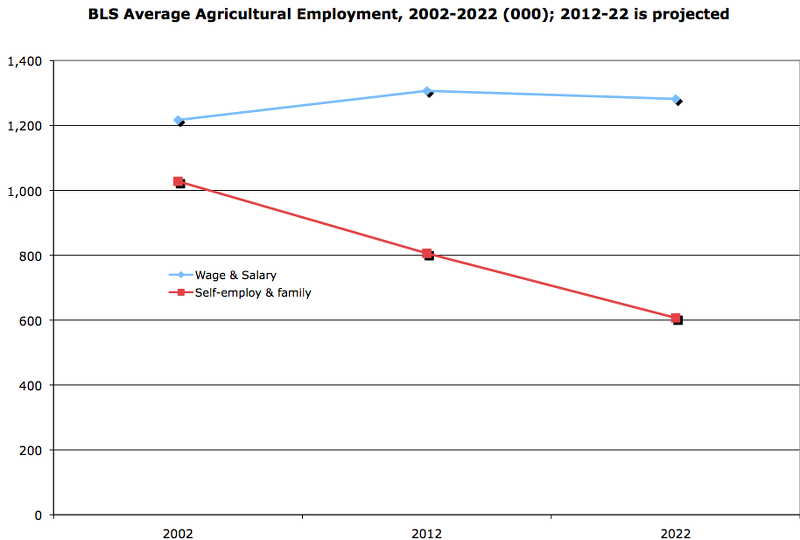 Average employment in agriculture declined between 2002 and 2012, and is projected to decline faster for self-employed and unpaid family workers than for wage and salary workers between 2012 and 2022. Wage and salary workers were 62 percent of average agricultural employment in 2012, and are projected to be 68 percent of average agricultural employment in 2022.